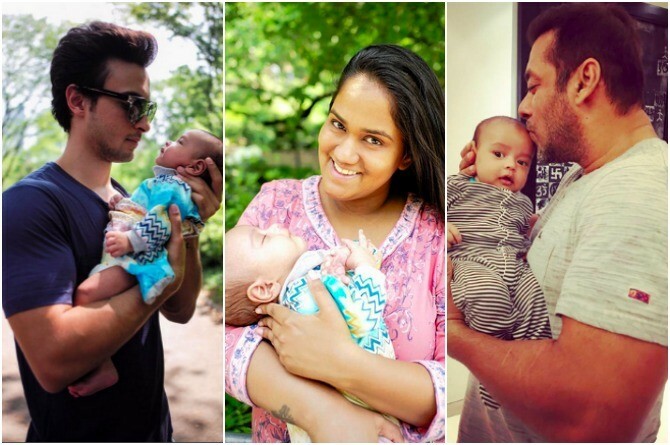 Arpita Khan along with husband Aayush Sharma, have become one of the most watched and adored new parents. And rightfully so! Salman Khan’s little sister Arpita Khan who recently became a mother to baby boy Ahil, has been busy in her new role. It seems she taken on her new responsibilities fairly well is doing a great job raising her little cub. In fact, you get a glimpse of her personal life through her social media accounts that are updated with adorable pictures of her new baby with his family. Clearly, Khan along with husband Aayush Sharma, have become one of the most watched and adored new parents. Their style of parenting is new-age, it’s fresh and it’s is teaching us some very important life lessons. As a new mum, it can be quite relaxing to see your parents and in-laws bond with your new baby. That’s because your baby now becomes the magnet that brings the entire family even closer. An important lesson to learn is the way to do it. For instance, even before her delivery, her entire Khaandaan threw her a lavish baby shower and came together at the hospital to bless the newborn. But this celebrity couple is different. They are modern parents who understand the importance of taking on equal responsibilities. So the father is as much involved with the baby as the mother. Continue to read about the new-age parenting style Arpita Khan has adopted. The next one will make you go Wow! As new parents we are often skeptical to go on a vacation with a newborn. But if you involve your baby in your vacation, it can be a great learning experience and you won’t feel guilty about it. We sometimes need to just relax and let the child explore new things. It’s always best to guide and be in control while your child does his exploration. Let him touch flowers or new soft toys or even people. You can always wash his hands or clean up him later. This exploration let’s the child develop better cognitive skills and can pick up on colours and individuals quickly. Continue to read about the new-age parenting style Arpita Khan has adopted. This next one is a must. Just because you are a new parent, it does not mean that your entire life has to revolve only around your baby. You don’t have to forget your individual self. Just take a break, hand out with friends and take back your life. Thank you @gauravmirchandani & @divyamirchandani for always being such great host in Nyc ???? This not only gives you an opportunity to rekindle romance with your partner, but also gives you a breather from all the feeding and poop cleaning responsibilities. So go on a date night or just hang out with friends. And taking the break point ahead, make sure that when you do take a break, your baby is in safe hands. Let your family pitch in and baby sit your little cub. They will after all do the best they can to take care of their new family member and he will be safe. If you are concerned about breastfeeding, just manage some pumping and store your breastmilk for the night. As for specific instructions, you can tell your family how you want them to handle your baby. Above all, it’s important to freeze and frame all the lovely memories you are creating with your baby. Take pictures along the way so you remember the great times you’ve had together. When your baby grows up, you can be innovative with these pictures and gift him a journal or a photobook. These are memories you will cherish forever. Dad Akshay Kumar shares the desi secret of his good health and fitness! Should I feed my child carrots if I notice symptoms of tuberculosis?